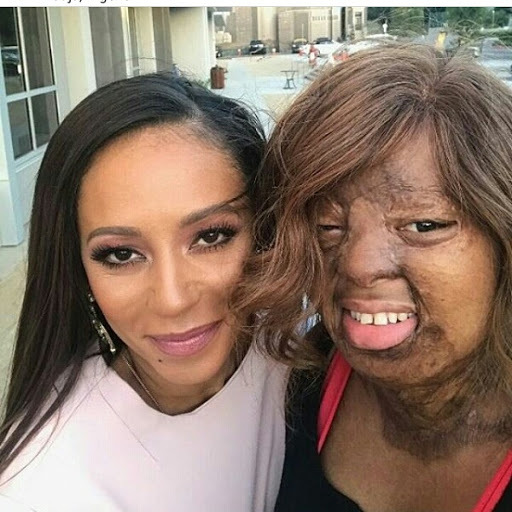 The beautiful Ms. Okwuchi was pictured in a selfie with popular Singer Mel B.
Ms. Kechi Okwuchi was one of the only two survivors in the ill-fated Sosoliso Portharcourt bound flight which crashed on the runway and killed 107 people. Kechi has had more than 100 surgeries, including skin graft in the US as a result of the severe burns all over her body. Doctors placed pins to support her hands but this didn't stop her from reaching for greatness as she is currently participating in the ongoing "America's Got Talent". She is beautiful and has the voice of an angel. Mimi's blog is her number 1 fan.